Hallelujah! The carry trade is back. Huge excitement. Small problem — nobody really knows where it is or how big it is. What we do know is that it’s definitely a good thing, and we should be very happy. Possibly. One of the most important and simultaneously intangible aspects of the huge wash of money rushing around the world is the carry trade. At its most basic, it is an enormously simple, effective, and fast way of making money. If that’s the case, then lots of people are doing it, right? You betcha. So why aren’t we all doing it? That, in fact, is a very good question. 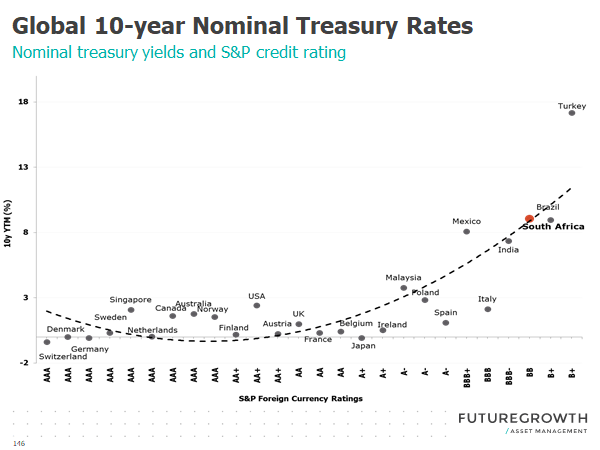 The way the trade works is this: You borrow money on a vast scale in a developed country, and you invest in government debt in a developing country and pocket the difference in the interest rates. If you think that’s too simple, you would be right, because there are reasons why there is an interest rate differential. There are, in short, risks. The first risk is that the interest rate differential will be wiped out by a decline in the currency of the country you invest in. For example, Turkey’s three-month deposit rate currently stands at 28%, while the same rate in the US about 2.6%. So if you invest, say, one billion dollars, in three months you will make a profit of $63.5-million. That huge wodge of boodle is effectively the difference between the interest rate you are paying in the US and the interest rate at which you are being paid in Turkey. There is almost nothing that would get you rich faster than that outside of helping your Colombian mates with their luggage at Heathrow. But if the Turkish lira drops by 25% in that time, you are losing rather than winning rather large dollops of cash. You could hedge that risk, but that’s going to cost you too, so that may be a partial, but not a complete answer. It’s a bet: You could lose. The other risk is that interest rates change. If Turkish interest rates go down and the US rates go up, you might have a problem. You could try to hedge those too, but once again, at a cost. Or you could minimise the risk by investing in several emerging market bonds at the same time. The danger of interest rates differences becoming narrower has been what has been restricting the carry trade for the past year or so. But recently, it seems, US interest rates are unlikely to change and may even go down. Emerging market interest rates, too, have been pretty steady. Currencies have been trading in a range, and some emerging market currencies have even been strengthening. All of this is just heaven for the carry trade. So how big is this puppy? It’s very difficult to tell because it’s hard to distinguish ordinary investment in government debt from the carry trade. 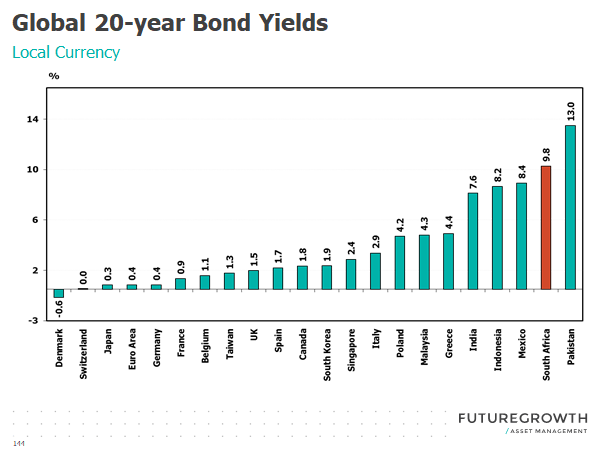 According to Futuregrowth portfolio manager Wikus Furstenberg “the only honest answer is that it is impossible to quantify the split, except to state that the presence of the foreign investor is substantial enough to drive yields in a certain direction at times. It really depends on so many other variables that may and may not play out simultaneously”. We can get a clue, however, just by measuring the amount of money moving into emerging market debt, and the amounts of cash moving in this direction is staggering, but more importantly, the direction has changed recently. And the change has been dramatic. According to the Wall Street Journal, for almost all of 2018, money was moving out of emerging market debt. But in January 2019, the wind changed. Every week, bar one, up to April 2019 something between one and four billion dollars on a net basis has been moving into emerging markets. How much of that has come our way? It’s hard to know, but certainly, there has been a noticeable change in the market recently. 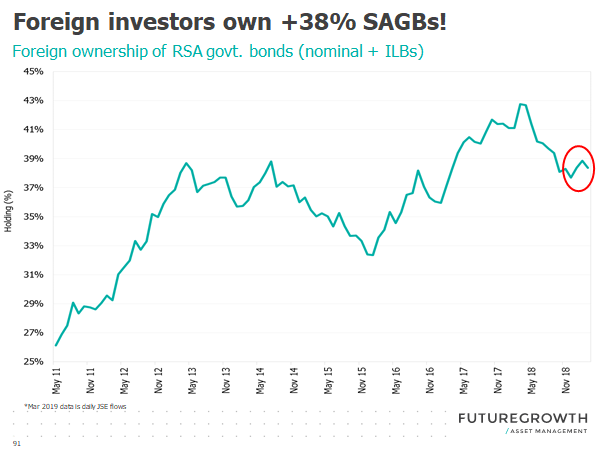 That is indicated by Johannesburg Stock Exchange data which show a really huge increase in the proportion of local debt owned by foreigners, which gradually decreasing throughout 2018. But in 2019, that has turned around. Furstenberg says that he suspects that the majority of local investors are neutral to defensively positioned. “This would indirectly lend more weight to foreign activity, specifically if they are keen buyers”. In other words, it’s the foreigners, not the locals who are moving the needle. But Furstenburg also issues a warning. “There are good reasons for the yield variance and as an investor, you have to be particularly well informed about the fundamental reasons for these significantly higher yields”. 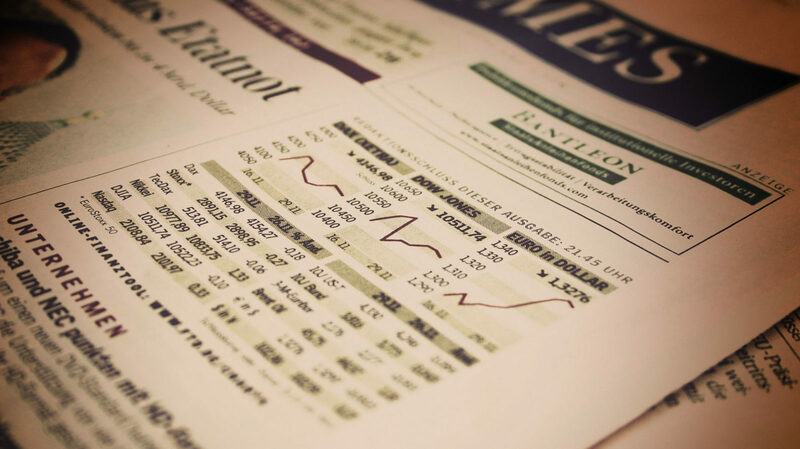 There are at least some offshore fund managers who tend to place a bit more emphasis on the difference between interest rates as opposed to the reasons for the difference. Still, it’s clear that foreign interest has perked up, he says. And having people who want to put money in, well, there is nothing bad about that. Correction: A previous version of this article miss-calculated the profit an investor might earn through the carry trade by investing in Turkish debt. Apologies for the error.